Yellowstone National Park: Jessie, 16 - "The Waterfall"
Now I can't open the door. About Jessie: "My name is Jessie. I live in Madison, Wisconsin. I hope I make a better life for myself going to school and not using drugs. I used to never go to school cuz I would just smoke, but now that I’ve been at Northwest Passage I’ve seen that you can do fun things without drugs to live life to the fullest. I wish the best for me, and I hope everything turns out ok. For me photography is a way I can express my emotions to the world in a way that other people can’t. 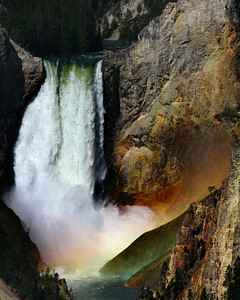 Yellowstone is the most beautiful place that anyone could ever see." 100 percent of proceeds help support Northwest Passage and it's mission to provide innovative mental health services for children and families.